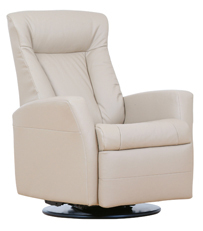 We invite you to stop by today to try out our best-selling IMG Norway Relaxers—exceptionally comfortable and ergonomic swivel-glider recliners. 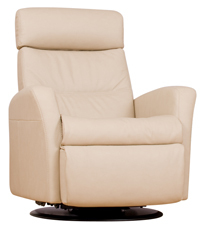 A wholly-owned division of EKORNES, IMG NORWAY features cold-cured molded foam seats and headrests that adjust both up and down and forward to back. 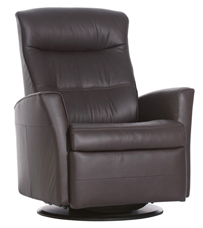 They're the most ergonomic chairs we've ever offered! 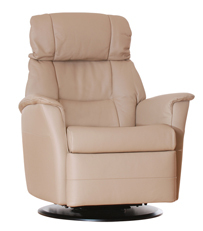 To see the many colors of fabrics and leathers, please stop by our store today or visit their website. 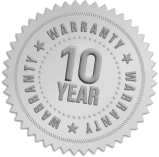 • WARRANTY: 10 years on steel frame; five years on mechanisms, wood base & molded foam cushions; two years on leather & fabric covers. "To protect our environment, we regularly assess the whole life-cycle of our production with focus on the type of raw material used, production processes, waste, use and disposal. The latest initiative has been our focus on water usage says President and CEO Nils Gunnar Hjellegjerde. We have found out that we can reduce our water consumption with 24% if we invest in recycling and reusing facilities. Basically implement a smarter way to use water more than one time!. We have just invested in new water saving equipments for our foam department in our Vietnam plant says Nils Gunnar Hjellegjerde. This is a win-win situation. We save water costs as well as protecting the environment. Creating sustainable products by using eco-friendly wood and raw materials, reducing waste factor and the energy consumption in our production processes as well as extending the useful lifetime of our products and recyclability are always in the mind set of the senior Management of IMG. But one of the best thing to do out of the respect of both our customers and the environment, is to make furniture that is long lasting says Nils Gunnar Hjellegjerde." CRYPTON® is manufactured exclusively for Guardian Protection Products, Inc. Crypton and the red planet logo are registered trademarks of Crypton, Inc.